O - Unreasonably high distortion in midrange drivers? The nonlinear relationship between SPL, excitation frequency and harmonic distortion products was investigated for three small midrange drivers as part of a search for an eventual replacement of the Peerless HDS 134, 850488, 5.25" driver that is used for PLUTO. Typically distortion increases with SPL or cone displacement. For constant SPL the displacement decreases as 1/f2 with increasing frequency and it could be expected that distortion decreases correspondingly. y = a0 + a1 x + a2 x2 + a3 x3 + .....+ an xn which is a power series expanded around x = 0.
and so on for higher powers of x. Thus harmonics nw are generated and dc terms.w will also decrease by dA (-1 dB), but the second harmonic amplitude will decrease by dA2 (-2 dB), the third harmonic amplitude by dA3 (-3 dB), the fourth by dA4 (-4 dB), and so on, at least to a first order approximation. The sound output from the unbaffled driver was measured with the microphone in the center of the plane that touches the driver's roll surround. Drive voltages are listed for 125 dB SPL. The amplitude of the harmonics is plotted relative to the fundamental. The fundamental amplitude was changed in 5 dB increments from 105 dB to 125 dB SPL. The dashed lines x show the relative change in cone excursion with SPL and frequency. Driver A is the Peerless 850488, the other two drivers were samples under consideration. 100 Hz - The relative amplitude change of the 2nd harmonic behaves exactly as expected. The 3rd harmonic starts out with the right slope for high SPL but then decreases more slowly. The 4th behaves strange at low levels. 300 Hz - Excursion x has decreased by 19 dB. The 2nd harmonic follows but not the others. 900 Hz - Excursion x has decreased by 38 dB. The distortion products do not drop correspondingly. 100 Hz - Slightly higher distortion than driver A. Serious misbehavior above 120 dB SPL. 300 Hz - Slightly lower distortion than driver A and similar behavior. 900 Hz - Large amount of 2nd harmonic. Again all distortion products are much higher than expected from the reduction in excursion. 100 Hz - Worse than drivers A and B. 300 Hz - The 2nd and 3rd harmonics have dropped less than in the other drivers. 900 Hz - High levels of distortion. The dominant nonlinear parameters in a driver are the force factor Bl(x), the stiffness of suspension Kms(x), and the electrical inductance Le(x). The effect of Bl(x) and Kms(x) should decrease as 1/w2 with frequency, but since the inductance increases as wLe its effect should only decrease as 1/w and possibly overtake the effects of the other two non-linearities. At least that is what has been suggested to me. All these parameters can be measured with a Klippel Analyzer, at least for low frequencies. 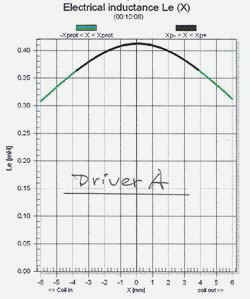 In the following I will estimate the Le(x) induced distortion based on measured Le(x) for drivers A and B. The voice coil inductance changes with displacement x in a nonlinear fashion as seen is the graphs for Driver A and Driver B. The behavior for small excursions around x = 0 can be approximated by the two expressions for Le below. Clearly there is a huge difference between the distortion estimates and the measured values. The questions is why? The mechanical displacements are extremely small and in the order of 30 micron. The displacements that produce the measured distortion are less than 1 mm. Which nonlinear mechanism is causing the distortion? The currents, magnetic fields, forces and accelerations are the same as at low frequencies for constant SPL, only the excursions are drastically reduced. 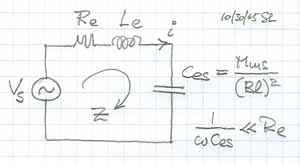 There is a second effect due to Le(x) that must be considered which is the reluctance force FL. This force has its useful application in electro-magnetic transducers like door bells and early headphones. Here it is an undesirable remnant. Its magnitude is derived from the energy that is stored in the magnetic field of the voice coil. For Driver A the gradient of Le(x) is zero and thus this type of distortion is zero. For Driver B the calculated distortion is still by an order of magnitude lower than the measured value. Thus I draw the conclusion that in these two cases the reluctance force is not the dominant factor. Estimates 1 and 2 do not mean, though, that Le(x) is insignificant for distortion at high frequencies. 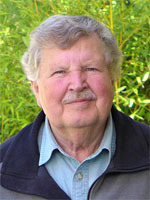 They only mean that for a high frequency excitation signal, with its very small voice coil displacement x, there is no significant amount of harmonic distortion generated. But, if a low frequency signal is present together with the high frequency signal, then the large low frequency voice coil displacements can cause large amounts of intermodulation distortion products near the high frequency signal due to the large low frequency variation of Le(x). The voice coil inductance changes also as a function of the current flowing through it. The magnetic field strength H(i) that is generated by the voice coil current produces nonlinear increases and decreases mH(i) of the static magnetic bias flux density B that is generated by the permanent magnet. 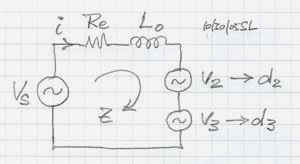 The permeability m of the magnetic circuit changes nonlinearly and with hysteresis losses. 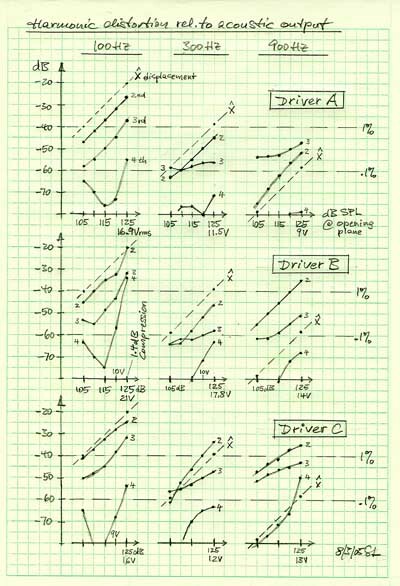 The value of dLe(i)/di is not known to me for drivers A and B. I have seen data for a driver where the inductance changed in the order of 3% per ampere without shorting rings and 2%/A with shorting rings. For the calculation below I have used a value of 3%/A. 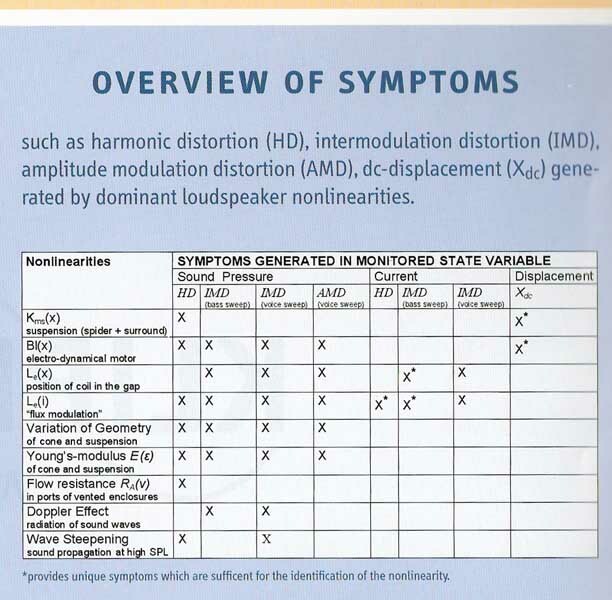 It appears that flux modulation is the dominant mechanism for harmonic distortion at high frequencies in these drivers. 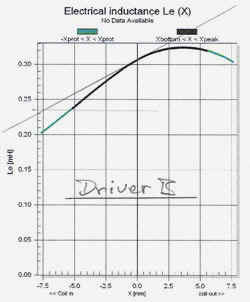 Driver A actually has shorting rings and Le(i) could not have changed by more than 0.5%/A in order to match the calculated value with the measurement. That may indicate a really good choice of materials and design. 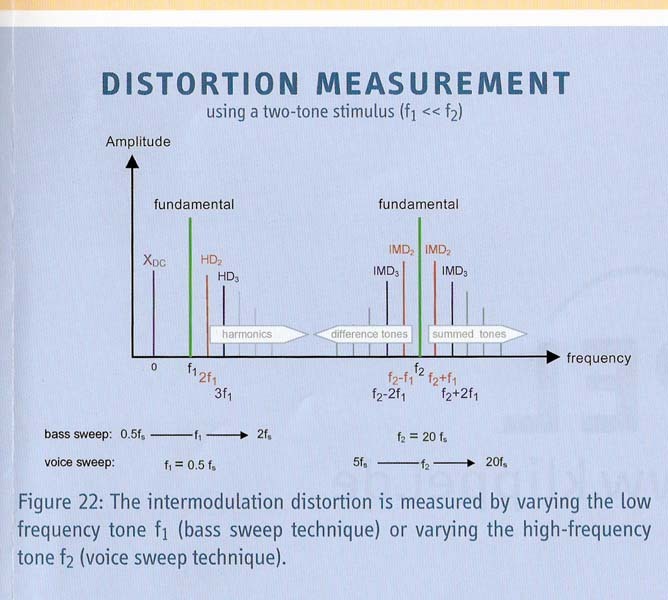 In summary, the measured values do not seem unreasonable, but there is certainly room for improvement of drivers B and C.
The two stimulus measurement method allows to see and separate out the effects of the dominant driver nonlinearities by measuring distortion in sound pressure, distortion of the voice coil current and dc-displacement. The table below indicates in which form the symptoms of the nonlinearities show up in the measurements. 4 - Klippel, "Interactive Listening Test"